North Korean leader Kim Jong-un’s step-grandmother and the national founder Kim Il-sung’s second wife Kim Song-ae died in 2014, South Korea’s Ministry of Unification confirmed Thursday, in a booklet of North Korean personnel data published annually by the ministry. In the updated booklet, Kim Song-ae was categorized under “deceased,” with a note saying that she died in 2014. This is the first time the government has officially acknowledged her death. Her sign and specific date of death remains unknown. Throughout her lifetime, it is believed that Song-ae had been under the scrutiny of Kim Jong-il and later Kim Jong-un as a threat to their power. She reportedly married Kim Il-sung in 1953, four years after the death of his first wife Kim Jong-suk — the mother of successor Kim Jong-il and grandmother of the incumbent leader. She gave birth to Kim Jong-il’s stepbrother Kim Pyong-il in 1954, who is now the North’s ambassador to the Czech Republic. 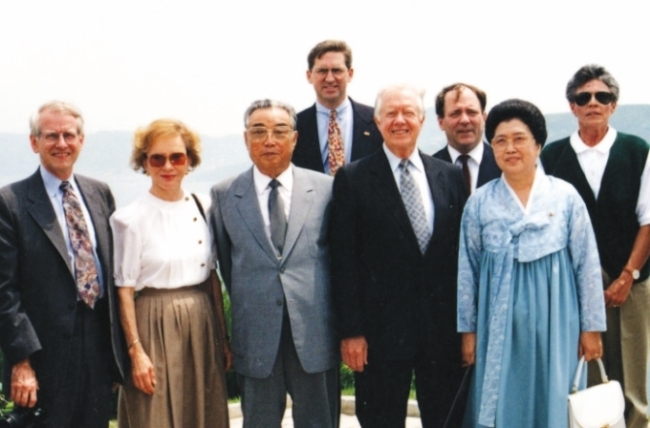 Pyong-il served as ambassador to various countries including Hungary and Poland after Kim Jong-il became the heir apparent for the communist state in the late 1980s. Analysts view his ambassadorship as a form of exile on the back of Kim Jong-il and Kim Jong-un’s efforts to sideline his power. Song-ae herself had been living incommunicado and out of the public eye for decades. She had several titles within the regime, such as the chair of the Korean Democratic Women’s Union, and was a member of the central committee of Korean Workers Party and Supreme People’s Assembly, but was stripped of the titles gradually after Kim Jong-il took power. The booklet also noted recent personnel changes within the regime. The post was previously occupied by Kim Yong-su, according to data released by the ministry earlier this year. North Korea’s recent media reports have been referring to Kim Yong-su as deputy director of the party, indicating a shift in his position. In 2013, Han was promoted as the head of the finance accounting department, which oversees finance in the ruling party. But rumors sparked that he was purged on corruption allegation when he disappeared from the public eye for months from March 2015. He proceeded to resume public activities late the same year in military uniform. The ministry also took note of new officials that entered international spotlight with North Korea’s shift towards diplomacy and engagement in nuclear talks with the US, this year. Choe Son-hui, North Korea’s vice foreign minister who ramped up her diplomatic duties this year, was included in the list. She is considered the counterpart to top US nuclear envoy Stephen Biegun. Choe was born in Pyongyang in August 1964, according to the data. Kim Chang-son, known as leader Kim’s de facto chief of staff, was also mentioned. He has played a key part in dialogue between the two Koreas and Pyongyang and Washington, as a head delegates to working-level talks for preparation of the April inter-Korean summit. He was believed to be in charge of protocols for the US-North Korea summit in Singapore in June.